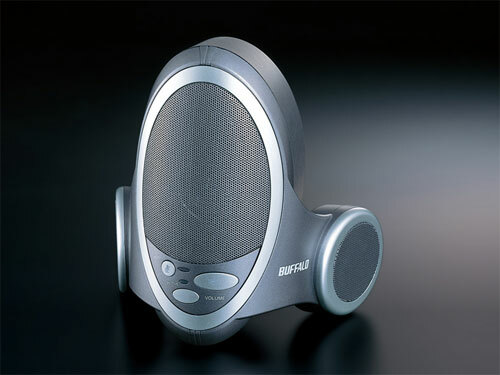 Headsets for making internet telephone calls, particularly for Skype, are ten-a-penny, but there aren’t a great number of speakerphones and certainly none is as stylish or cheap as the latest from Buffalo Japan. For ¥9,800, Tokyo businesses operating on a shoestring can avail themselves of Buffalo’s elegant BSKP-CU202/SV. As with most products from the firm, the naming is a mess, yet the functionality is anything but. The desk-phone needs no drivers, simply plugging into a USB port. As it’s bus-powered, there’s no need for an AC adapter either. In addition, a total audio output of 6W through three channels makes the setup a reasonable speaker system for most machines. Lastly, with both echo- and noise-canceling circuitry installed, the CU202 should put paid to those annoying quality problems that dog Skype and its 171 million users worldwide. Oh, and we should probably point out that there’s absolutely no reason not to plug in and fire up an alternative/better VoIP app, such as Gizmo.